I have a raised vegetable garden and planted a number of vegetables about a month ago (they were in 3 or 4-inch pots, ready to be transplanted - i.e. not from seeds). In the past week or two, I've noticed a weird substance on some of them - black kale and brussel sprouts in particular. I've attached a photo, but the best I can describe it is that they look like small greyish/white sesame seeds. Maybe eggs of some insect? But they're very soft - if you touch them at all, it's almost like touching ashes from a fire or something. I'm not touching anything with them, but is it ok to wash and eat the leaves that look fine (only a few leaves per plant have them, and they are kind of sitting in the middle of the plant (where new leaves come up from) as well). I'm a very amateur gardener - if there's any other information I can provide, just let me know. Thank you! You have a nasty aphid infestation. Use a strong jet of water to wash them off. But they'll come back. If you have plants that attract aphid predators such as ladybugs, and parasitic wasps you might get away without using insecticidal soap sprays etc. Your question told us that these plants were starts? Did you grow them or did you purchase them from a store? Buying them from a store or starting seed/start indoors means acclimating before planting. That could have caused enough stress to make your plants more susceptible. Aphids and whatever else has decided to make use of a weakened plant are fine to eat, ugh, but I would cut these leaves from the main stem and put in compost. I would also use a NEEM solution sprayed on this young plant to help it resist other soft bodied insects, get rid of EGGS. Spraying helps, but if you spray too hard it defeats the purpose. These aphids are normal, if controlled early will cause no harm to your plants and the coolest thing is that aphids are temporary. The leaves that host this many aphids are fairly toast and should be removed. Spray Neem only at night and please read the directions...at least twice before mixing and using. If it says it is safe for bees don't believe it...spray at night when bees are not active. You should get plenty of healthy leaves after this period of time with this brand of aphid. If you got these plants from a store they already had insects included. Normal. Not your fault. Easy to control, never worry about eradication. Next year you might want to try predator controls...they work well as long as you can relax about a little damage. 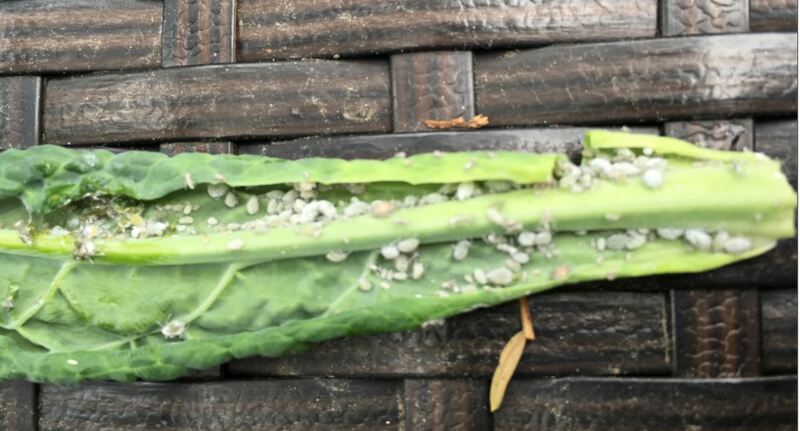 Now is not the time to use predator controls...for later in the season there are other insect 'attacks' that might be mitigated by some predators...black aphids on brassicas and artichokes? Healthy plants are able to control insect populations and disease very well. Have you used any fertilizer at all? When I plant my starts in the garden I always acclimate first...then I add a balanced fertilizer. Critical. I concur with other answers... your plants are suffering a heavy aphid infestation. As mentioned by others, a strong jet of water is the best method to remove the bulk of the aphid infestation. This task of jetting will most likely need to be done daily for a few days. Your plants will benefit from companIon plants - plants that by their nature provide a benefit from growing together - my recommendation for the brassicas you have is to grow companion plants among your seedlings, including chamomile, dill, marigold, nasturtium, thyme to name a few (also if you have space, plant zinnias - ladybirds flock to zinnias and ladybirds love eating aphids). When you spray to kill undesirable (pest) insects, you also kill desirable insects. By way of example... during our last summer, we suffered a heavy aphid infestation throughout our two citrus trees. I removed the majority of these sap-sucking pests and their caretaker ants with a strong jet of water, sprayed daily. For two weeks I was very tempted to apply a mist of white oil to suffocate the remaining aphids, but decided to wait for the ladybirds to arrive. Unfortunately the ladybirds didn’t arrive but thankfully a few hover flies did. I watched with fascination as they laid their larvae throughout the citrus trees and within three or four days of their arrival, not one aphid remained. wait for predatory insects to arrive to consume the remaining pests. Not the answer you're looking for? Browse other questions tagged vegetables pests fungus or ask your own question. What is this bluish-grey bug on my lettuce, and how do I treat it? Why did my tomato plant stop growing after transplanting? Caterpillars don't lay eggs so how is this happening? What relevance does fungal dominance have to a vegetable garden? What happens to my tomatos?